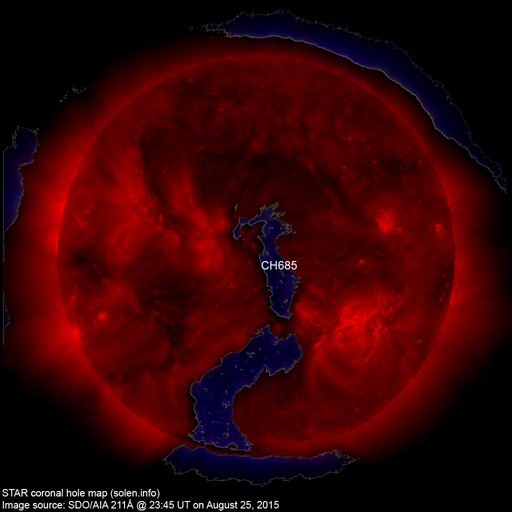 Last major update issued on August 27, 2015 at 04:30 UT. The geomagnetic field was unsettled to active on August 26. 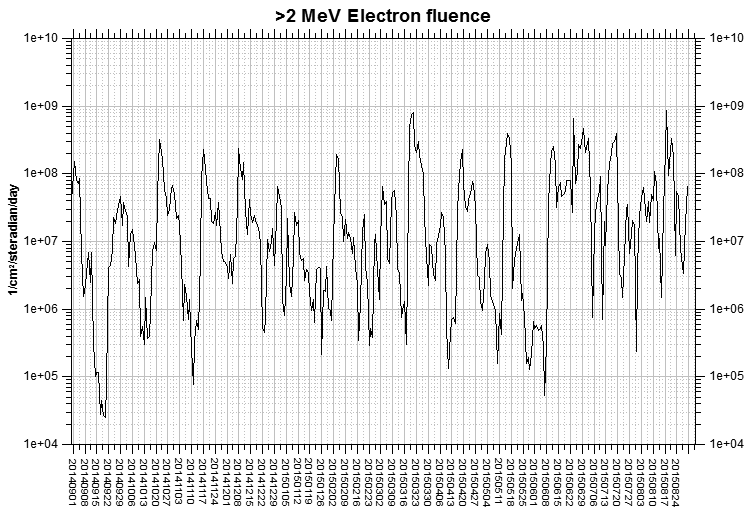 Solar wind speed at SOHO ranged between 350 and 424 km/s. 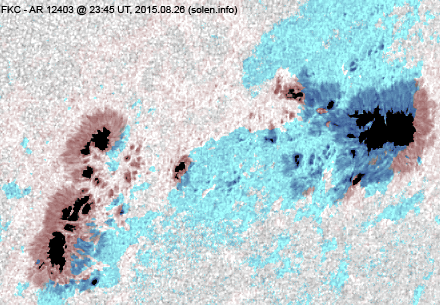 A disturbance (source unknown) was observed beginning at SOHO near 08:15 UT. For the remainder of the day the solar wind was low speed, high density and fairly cold while the interplanetary magnetic field slowly became stronger with an increasingly more southward Bz. Early on August 27 minor to major geomagnetic storming is being observed. 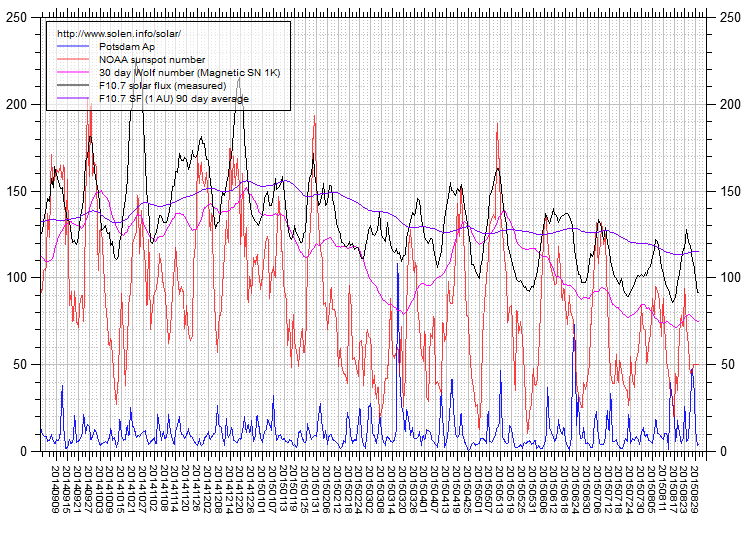 Solar flux at 20h UTC on 2.8 GHz was 126.2 (increasing 24.2 over the last solar rotation). The 90 day 10.7 flux at 1 AU was 114.9. 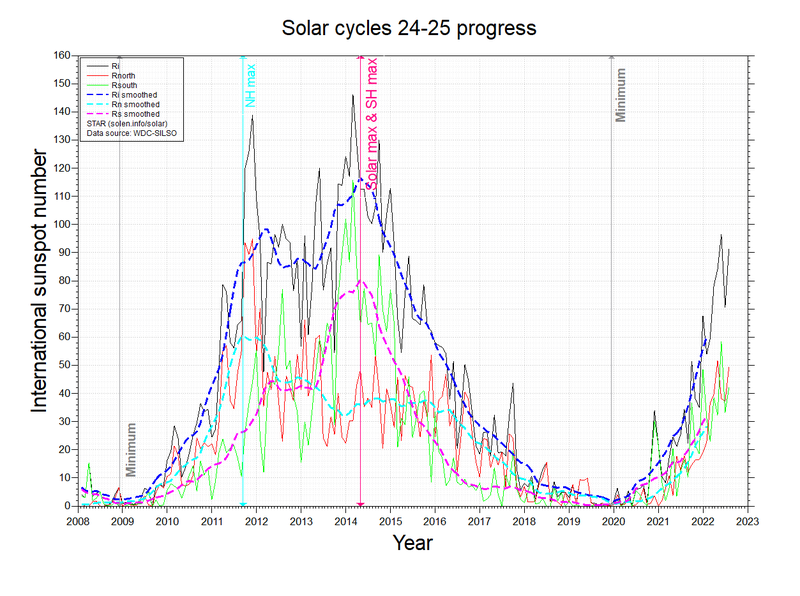 The Potsdam WDC planetary A index was 25 (STAR Ap - based on the mean of three hour interval ap indices: 25.1). 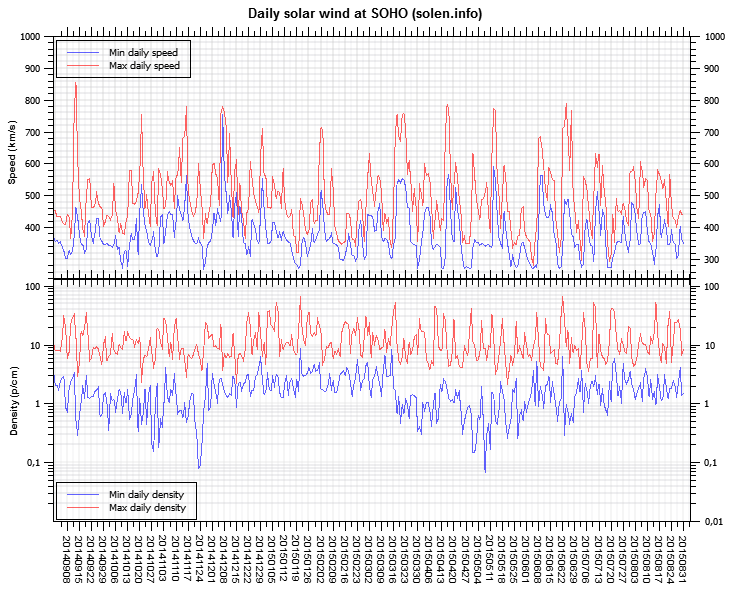 Three hour interval K indices: 33344444 (planetary), 33355333 (Boulder). 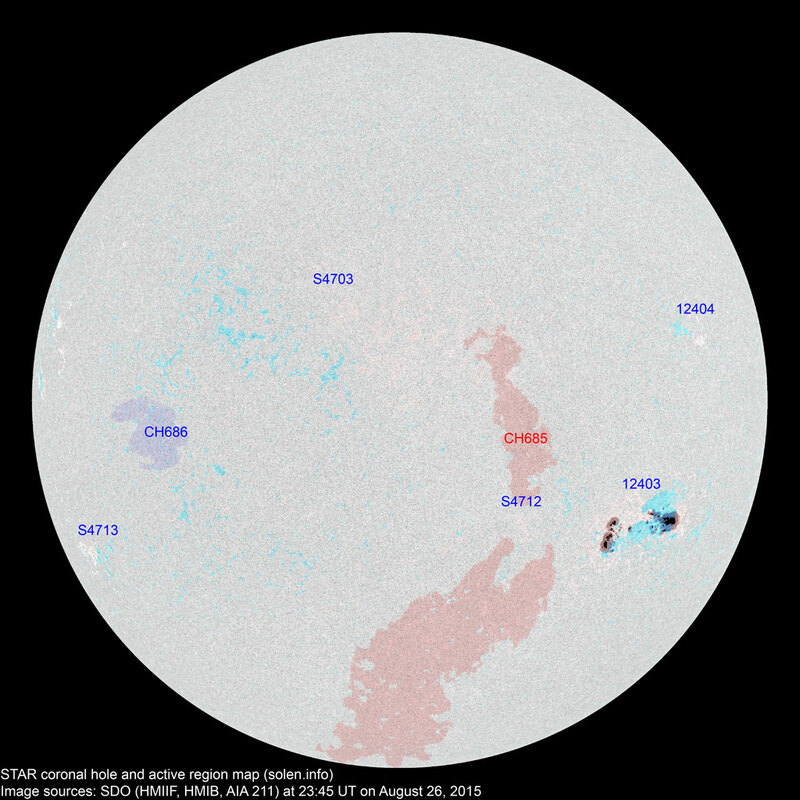 At the time of counting spots (see image time), spots were observed in 5 active regions using 2K resolution (SN: 121) and 3 active regions using 1K resolution (SN: 67) SDO images on the visible solar disk. Region 12403 [S15W43] decayed slowly in the trailing spot section with penumbral fragmentation observed and the loss of a magnetic delta. The leading spot section has two magnetic deltas and there is a fair chance of an M class event before the region rotates out of view. losing penumbral area and spots. Region 12404 [N14W58] decayed slowly and quietly. S4703 [N16E22] gained more trailing polarity penumbra spots and was quiet. S4712 [S13W20] was quiet and stable. 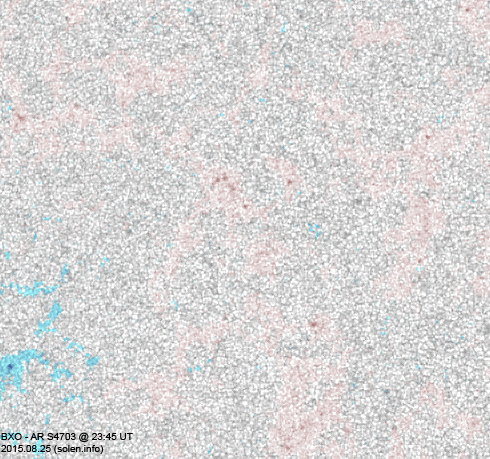 New region S4713 [S21E62] was observed with penumbra spots. August 24-25: No obviously Earth directed CMEs were observed. August 26: A CME was observed off the west limb from 20:36 UT in LASCO C2 imagery. 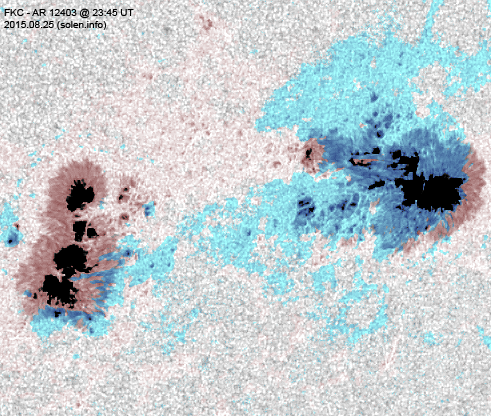 This was likely associated with an extensive filament eruption to the north and northeast of AR 12403. Further LASCO imagery will be required to determine if the CME has any Earth directed components. The geomagnetic field is expected to be unsettled to major storm on August 27. A high speed stream associated with CH685 could become geoeffective late on August 27 and may cause quiet to active conditions on August 28-29.